We got a new camera. Stepped up to an SLR. I know it can do amazing things. I just don’t know how to make it do any of those amazing things, as you’ll see. Below is a picture of Stella and her Animal Hospital. She loves it, and so do I. When she gets engrossed in her veterinary work, I get precious time to waste on my blog, twitter and Facebook page. 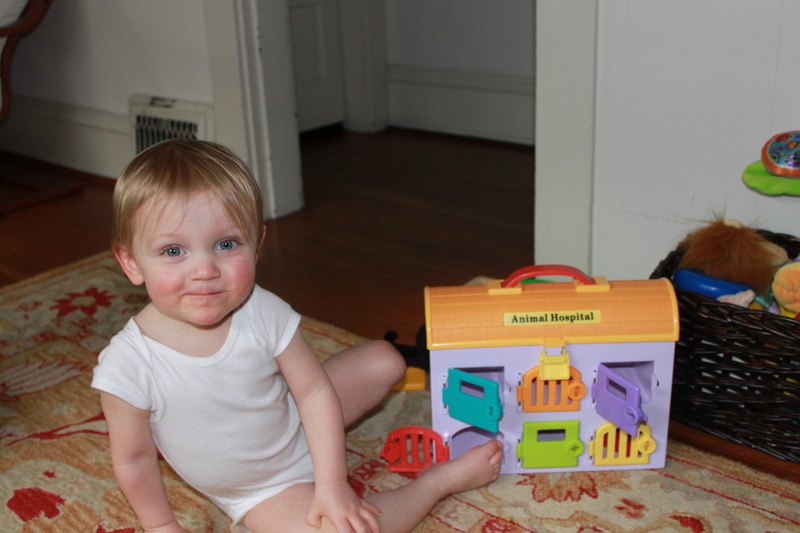 She attempts to unlock the tiny cages that look like stacked tombs, says “ba-boom-ba-boom” while holding the stethoscope, and administers “Boo Boo Cream” to the toy’s accompanying kitty. Once in a while, she’ll even branch out and vaccinate me and Cody with her little syringe, giving an adorable but piercing little yell of faux empathy. The hospital is not on the up-and-up, though, because the cages aren’t much bigger than the animals. They certainly can’t turn around or even walk at all. Please don’t report her to the Human Society, Ingrid Newkirk, or anyone like that. I bet I can convince Stella that a little investment in her facilities will eventually result in a huge boost to her bottom line. She loves animals, but this is a business, first and foremost. Casual Friday at Stella's Animal Hospital. 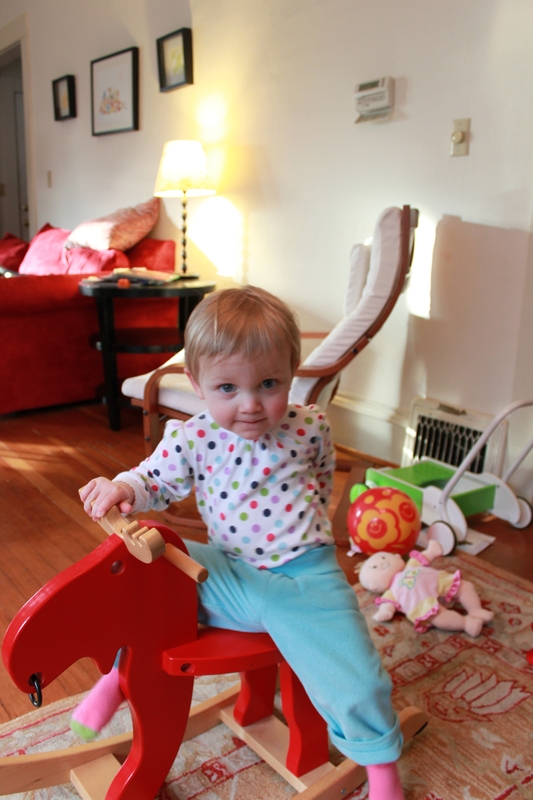 And here’s a shot of Stella on her rocking moose. I love the vibrant colors and light in this photo, and how the background is slightly blurred, but Moosey’s nose is in focus, rather than Stella’s. And before you say anything, Stella’s baby LIKES to sleep on the ground okay? It’s not a problem or anything. It’s what works for them so please don’t judge. Moosey was successfully treated (for severe motion sickness) at Stella's Animal Hospital. Their eyes are identical. But Stella has my knees, so I don’t feel left out or anything. Stella’s hair style is an “interesting look.” She’s never had a hair cut. Those bangs are natural. Her hair is long and stick straight on top, wavy and short on the sides, and long and curly in the back. 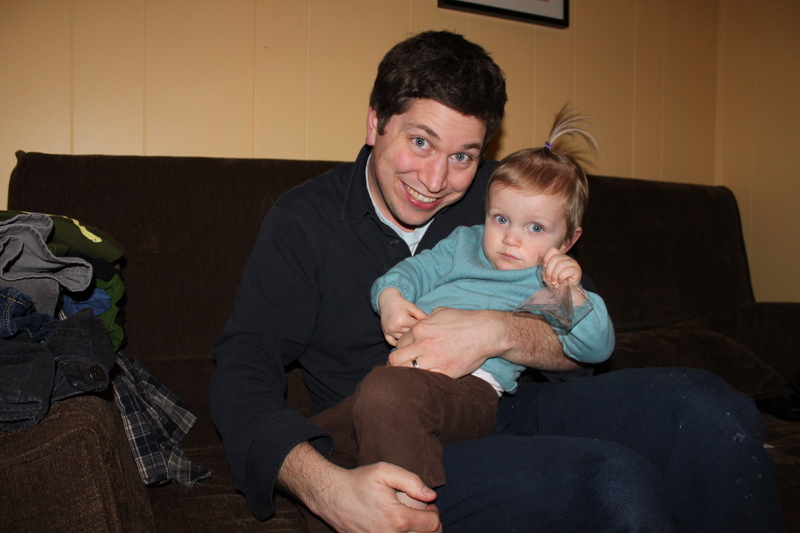 There is no decernable part, unless you count the adorable spiral of her hair from a central point in the back. As soon as I put any of them in her hair, Stella rips out the wide variety of cute clips I bought on Etsy. So this was my attempt at the most minimal and least intrusive style possible, a last ditch effort to tame her unruly mane and prevent everyone from assuming she is a boy, even while wearing pink (come to think of it, this once happened while she wore a pink hat, so maybe I can’t blame the hair). Not sure we’ll be going back to this look. Besides, it lasted 15 minutes before she tore out the band. Stella, 357. Me, 0. There is a lazily-left-behind pile of clean clothes right next to Cody, yet he chooses to wear dirty pants. You’re going to have to talk to him about that. I wear dirty clothes all the time, but only because ALL my clothes are ALWAYS dirty. There’s a big difference. Huge, actually. Not that I’m perfect or anything. Just superior. Even when it comes to wearing filthy pants. Cody’s smile, while attractive, is a bit “intense.” It’s because Stella was actually flailing maniacally and had finally stopped for a brief second to permit a photo (or because I yelled crazy gibberish loud enough to catch her attention), and he’s really smiling as hard as he can in an attempt to cover up any annoyance or stress involved in the struggle that preceded. 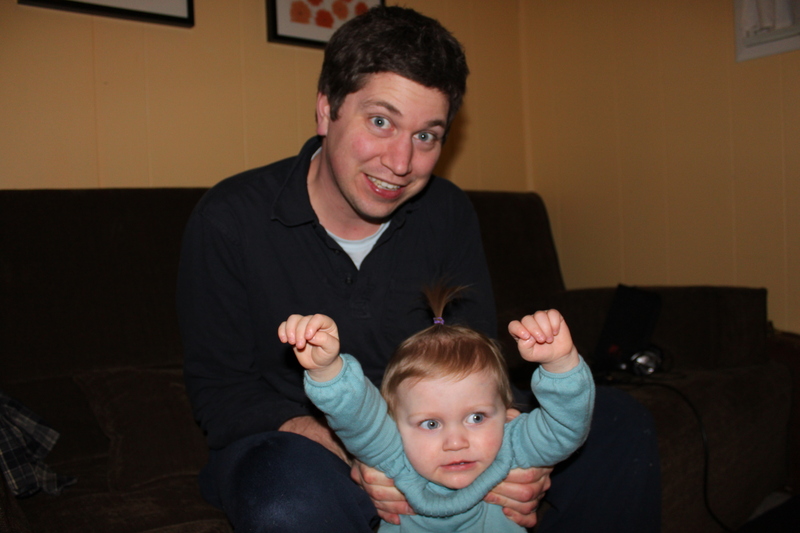 Also, he always looks insane in photos. There are even legendary stories about this fact, which I’ll probably share in a future post. Because I know you’ve been waiting for that. Hang in there. It's a blue-eyed party and mommy isn't invited. Ever. I’m looking into beginners’ digital photography classes. I know. I’ll definitely focus on how to get good action shots. This entry was posted in Canon bomb, Family update, Photos, Uncategorized and tagged criminal toddler veterinarians, cute baby hair clips, michael pollan, sub-novice photography, toddler. Bookmark the permalink. So funny! 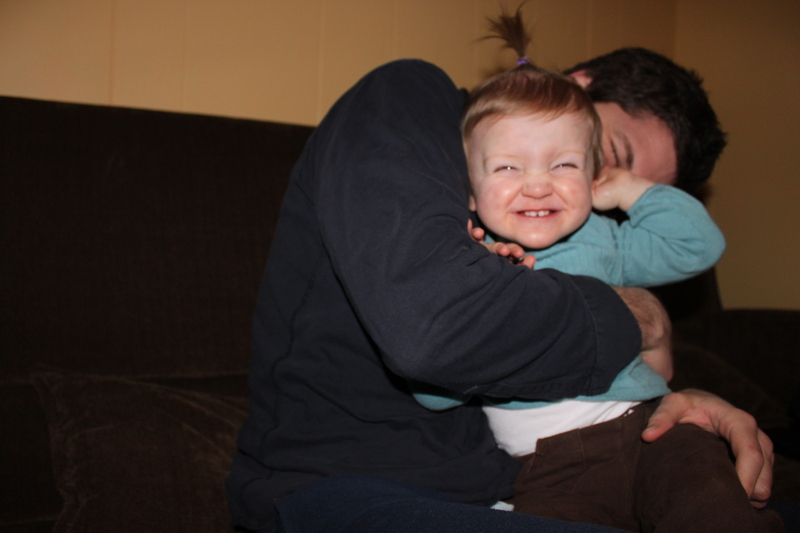 I posted a similiar set of pictures of my husband trying to contain our 2 year old for a picture. It’s nearly impossible!! Your husband just looks incredibly happy and very nice. Thanks for the compliment about Keira. I love the name Stella too!